For many of our readers, the BMW 1 Series F40 planned for 2019 comes with a lot of question marks. The new compact hatch entry into the world of BMW will ditch the proven and fun rear-wheel drive philosophy and instead use the current UKL architecture for vehicles with front-wheel drive. For the decision makers in Munich, however, it is clear that the customers who bought the BMW 1 Series primarily because of its driving dynamics are a small minority. For the great majority, other factors such as design, brand image, efficient engine and infotainment system play far more important roles than balanced weight distribution and a rear-wheel drive. This theory is confirmed by the success of the competitors – neither the Audi A3 nor the Mercedes A-Class use a rear-wheel drive platform. The lower cost and space-saving benefits resulting from the transversely mounted engine play a more important role for the vast majority of compact-class customers than the driving enjoyment potential of the standard rear-wheel drive. 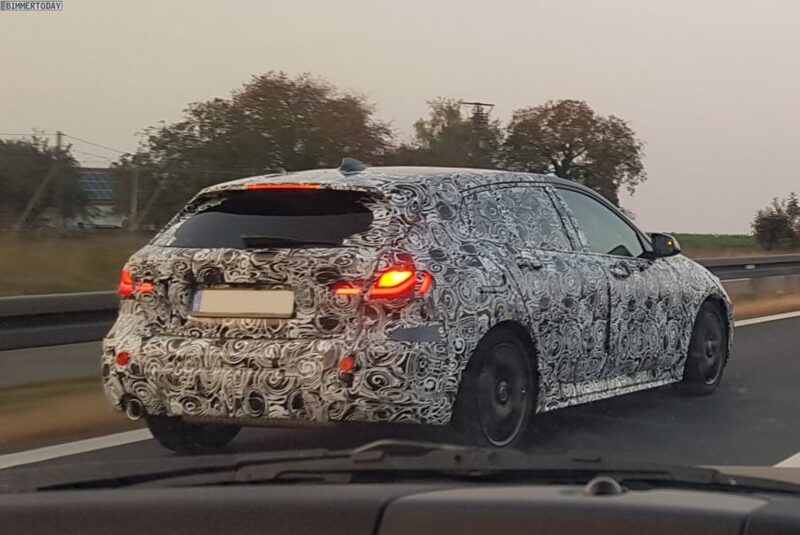 Recent photos of Bimmertoday’s reader Philip show a prototype of the BMW 1 Series F40 on the highway, somewhat unveiling the design of the taillights. Also interesting is the tailpipe configuration with only one tailpipe on the left side. After all, some newer BMW models already feature a solution with two tailpipes for small engines. In the case of the single tailpipe configuration, we assume that a three-cylinder engine is used under the bonnet. It is expected that all four-cylinder engines will be available with two tailpipes, with the more powerful engines featuring all-wheel drive xDrive as well. Most customers, however, will order their BMW 1 Series F40 as a front-wheel drive and thus forego the additional weight, but also the higher traction of the Haldex solution. A big step for the new 1 Series will be found in the interior. While the quality of the materials and the workmanship, especially in the first, but sometimes also in the second generation, caused criticism, the interior should now be above all doubt and meet premium requirements everywhere. With iDrive 7 and the Intelligent Personal Assistant including “Hey, BMW “, of course, the infotainment will also be brought up to date.